If you enjoy riding a motorcycle, you want to make sure you are not only educated on how to ride, but that you are covered financially if an accident were to occur. It's always best to be prepared so if that happens, you know what to do and if you've just been in one, you can learn what to expect next in these pages. Well-known for his litigation tactics, attorney Stephen K. Brooks has represented countless parties with personal injury claims involving motorcycle accidents. Because he can't represent everyone, he is now sharing his wide range of knowledge regarding motorcycle accidents and insurance litigation in this book. Written in clear, non-legal language, Steve will tell you what you need to know about dealing with insurance companies and the legal system to get the best settlement possible along with some preventative maintenance. That way, if you are injured in a motorcycle accident, you have the best coverage to protect you possible. Since in the state of Florida, you are not required to have your motorcycle insured, it is imperative that you go that extra step in acquiring some good, solid insurance. Steve partnered up with Motorcycle Riding Expert, Joe Strohmier, owner and operator of Joe's Motorcycle Training, LLC (opened in 2009 and now has 5 locations throughout florida) to help him write this book. Joe opened his training program to help save lives, provide jobs, and make a living. He and his team have trained over 7,000 riders and are regularly called upon by local media as subject matter experts. 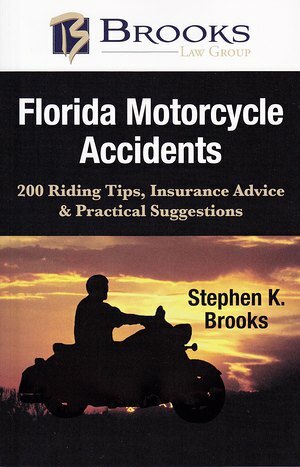 In Florida Motorcycle Accidents , you'll discover: What Causes Motorcycle Accidents Why Motorcycle Accidents are Especially Dangerous Types of Injuries Common to Motorcycle Accidents Insurance Coverage Options For Motorcyclists Over 200 Riding Tips and What to Do In Case of An Accident Steve and Joe hope you read this book. Not only will you help yourself, but you can help others too by passing this vital information along.